Former President Jimmy Carter says the income gap in the United States has increased to the point where members of the middle class resemble the Americans who lived in poverty when he occupied the White House. 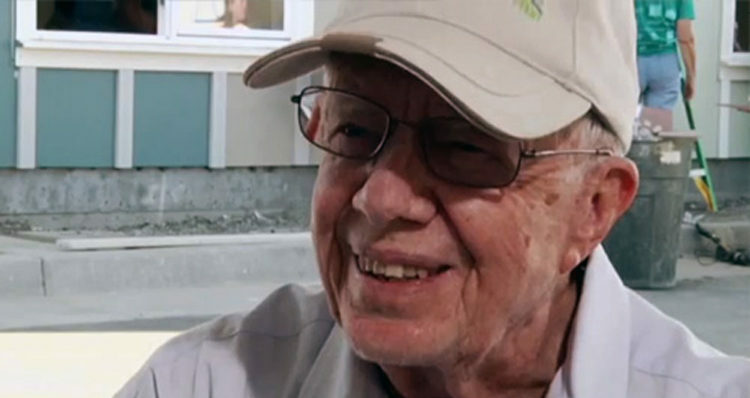 As USA Today reports, Carter offered his assessment of the nation’s economic challenges at a Habitat for Humanity construction site in Oakland back in March of 2013. This was the first of a five city tour that he and his wife, Rosalynn were visiting to commemorate their three-decade alliance with Habitat for Humanity, an international nonprofit that promotes and builds affordable housing. “Even in one of the wealthiest parts of the world there is a great deal of foreclosures and now a great deal of people who are fortunate to own their own houses owe more on them than the houses are worth in the present market, and that’s all changed in the last eight years,” Carter said in an interview with The Associated Press (below). “The disparity between rich people and poor people in America has increased dramatically since when we started,” he said.